Because Cysview causes cancer cells to glow bright pink under blue light, tumor margins and hard-to-see lesions become more clearly visible during a cystoscopy. 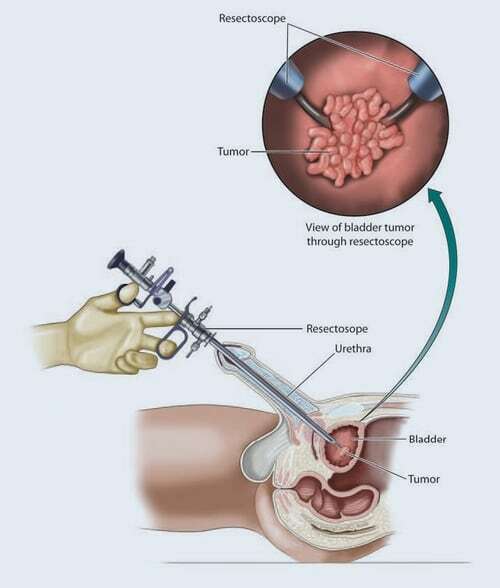 As a result, the cancer can be more thoroughly removed by TURBT. A complete TURBT is critical in NMIBC management for accurate tumor typing, staging, and grading, as well as optimization of patient outcomes. An incomplete TURBT can lead to under-staging, misdiagnosis and incomplete resection; and over-reliance on intravesical therapy may lead to less optimal treatment, worse outcomes and increased costs for patients. BLC with Cysview offers optimal diagnosis right from the first TURBT. The majority of patients thought Blue Light Cystoscopy with Cysview was worthwhile and would recommend it to others. 2 Chang SS, Boorjian SA, Chou R, et al. Diagnosis and Treatment of Non-Muscle Invasive Bladder Cancer: AUA/SUO Guideline. J Urol. 2016;196(4):1021-1029. 3 Cumberbatch MGK, Foerster B, Catto JWF, et al. Repeat transurethral resection in non-muscle-invasive bladder cancer: a systematic review. Eur Urol. 2018;73(6):925-933. 4 Richards KA, Smith ND, Steinberg GD. The importance of transurethral resection of bladder tumor in the management of nonmuscle invasive bladder cancer: a systematic review of novel technologies. J Urol. 2014;191(6):1655-64. 5 Smith AB, Daneshmand S, Patel S, et al. Patient-reported outcomes of blue-light flexible cystoscopy with hexaminolevulinate in the surveillance of ballder cancer: results from a prospective multicentre study. BJU Int. 2019; 123(1):35-41. 6 Richards KA, Smith ND, Steinberg GD. The importance of transurethral resection of bladder tumor in the management of nonmuscle invasive bladder cancer: a systematic review of novel technologies. J Urol. 2014;191(6):1655-64.